Who’s he think he is? Luka Doncic? The uptick in boards, dimes, and field goal percentage have been lovely to see. Maybe the Stevie Franchise comps weren’t so o…..SLAP!!! Ok, my bad Mr. Francis. Still, no D stats and the free throw shooting, while improving, often languishes in the high-60s. As a result, he’s just outside top 150 value. Lately, he’s been receiving over five more minutes than his season average. Showcase Showdown for sure. I’d expect him to be on another team sooner than later. Led the team in scoring. woo. hoo. Meeeeeeeeeeehrison Barnes has been a top 275 player over the past six games. Ha! What an awesome line. No clowning from me, though. Nothing but respect for a legend. The Mavs took the K from the _nicks, 114-90. As a result, no starter played more than 29 minutes. _evin _nox led the _nicks in scoring with 17 points on 6-of-16 shooting. No one else did much of anything except…..
Ha! Enes Kanter played 9 minutes. Have we decided yet? Are the _nicks “Tryin'” or “Not Tryin'” for Zion? Because both make sense. Top 10 player on the season. Over the past three games, he’s been the #3 player. No Jokic! Played 29 minutes off the bench. Top 100 player over the past seven games despite playing only 24 minutes per game. The Nuggets are going to be a problem come playoff time. They are very deep in the backcourt and play good D.
Miller has started three of the last four games and has been a top 40 player. The shooting efficiency hasn’t been pretty (37%), but he’s jacking up a ton of shots and draining 3.5 threeecolas per game. We call this the spray and pray approach to basketball. These are indeed very strange times. He’s the “Man” now and has been producing. I thought the usage rate would be higher, though, as it’s only increased from 25 to 27. James Harden has tainted my perspective of basketball. That’s back-to-back impressive games for Williams. He has the ability to contribute across the board and has received 30 and 38 minutes the past two games. Now, he’s likely getting most of this run because Julius Randle and Nikola Mirotic are down with injuries, but the Pelicans could be sellers and start the rebuilding process, which would make Williams an intriguing player. As Monte Morris endears himself to the coaching staff by taking care of the ball, Williams is on the same level due to his hustle. Played only 22 minutes because…..he fouled out again! Shocker. JJJ leads the league in fouls per game at 3.78. He has 193 on the season, which has him on pace for 310. The all-time record for fouls in a season is 386 by Darryl Dawkins back in 1983. Remember when Holiday was shooting 40% from downtown? Those were good times. Top 20 player over the past eight games. Played 23 minutes. Rabb has received over 20 minutes of run twice this season. He dub-dubbed in both games. The future texted and wrote that it’s arriving shortly. ETA TBD. Played 32 minutes off the bench. Has played 32, 23, and 29 minutes the past three games. The future texted again and wrote that ETA could be in a few minutes. Caboclo is 23 years old, 6′ 9″ 205 pounds, and hails from Brazil. The Raptors selected him with the 20th overall pick back in 2014. Played 26 minutes due to foul trouble. meeeeeeeeeow. Got another start because Jeff Teague (foot) and Derrick Rose (ankle) were out and played a team-high 43 minutes. He’s been a top 100 player over the past four games. The efficiency has been bad (39%), but he’s been contributing points, threeecolas, boards, dimes, and steals. Remember what I wrote in the Okafor blurb? That. The Pacers lost to the Wizards, 89-107. No starter played more than 27 minutes and the leading scorer was Thaddeus Young with 13 points. Three starters (Myles Turner, Darren Collison, and Edmond Sumner) scored in single-digits. NO BLURBS FOR YOU!!! Got the start but only played 16 minutes because….he sprained his left toe. Good times. Played only 19 minutes. Over the last seven games, he’s averaging 22.2 minutes per game. Good times part deux. Now the murmurs of we don’t need no stinking Wall are being heard again. Typical D. C.
Played 29 minutes. Could be up for a minutes boost if OPJ is out for any period of time. Time to make good on those LeBron comps. Played 26 minutes after going a perfect 5-for-5 from the field the prior game, good for 15 points in 8 minutes. Shrug emoji. It’s D. C. after all, where a reality tv star is President of the United States. Over the past three games, Markkanen has grabbed 13, 19, and 15 boards. He is Brook Lopez’s Anti-Christ. If you need dimes and poor field goal percentage, you Dunn come to the right place. Got the start because Zach LaVine (ankle) was out and played 35 minutes. Hmmm, I saw the stat line without looking at the name and was prepared to give props to LaVine for dishing out the dimes. Well, what do you know. Played 24 minutes off the bench. Top 125 player over the past eight games. Portis has been averaging 25.6 minutes but been garnering a 25.4 usage rate. Serious question. Who would win in a fight between Portis and James Johnson? Conventional wisdow has to swing the pendulum to JJ because he’s a black belt and all, and comes from a family of fighters buuuuuuuut you can never count out crazy. Played 18 minutes. I’m taking crazy. Only played 15 minutes because Robin Lopez was giving him the business. Good times part tres. Played 33 minutes. Whatever the opposite of symbiotic is, that’s the relationship Whiteside and Bam have. Played 28 minutes off the bench after missing a game due to injury. Dwayne Wade (knee) did not play, so that afforded more minutes for Johnson. The Hornets got trounced in Boston, 94-126. Only four players scored in double figures. NO MORE BLURBS FOR YOU! Only played 27 minutes due to the blowout but led the Celtics in scoring. That made Channing very happy as he would accidentally get some Google hits. Got the start because Kyrie Irving (hip) was out. The Celtics need to hire a hypnotist so that, even when Rozier comes off the bench, he thinks he’s starting. Played 30 minutes in blowout run, but…..Can I resurrect the Kawhi 2.0? SLAP!!! Young has stayed the course all season long and is now putting up….checks numbers….top 70 value over the past six games but top 20 value over the past three games! It’s all about the shooting efficiency and turnovers for Trae. 62% over the past three games? Unsustainable but good to see nonetheless. Hawks got spanked, 113-135 by the Kings so…..NO MORE BLURBS FOR YOU!!! Played 28 minutes. Blowout run plus going against the fastest-paced team in the league equals fantasy money. Only played 21 minutes, and it was mostly blowout run, but….Damn! Someone check on Craig to make sure he’s alright. Man, the night was full of blowouts. And another one, as the Jazz got thumped by the Blazers, 105-132. NO BLURBS FOR YOU!!! Fine, I won’t be that lazy. At least all the Jazz starters scored in double figures: Derrick Favors (12), Joe Ingles (14), Rudy Gobert (15), Ricky Rubio (12), and Donovan Mitchell (22). It got so bad that Grayson Allen played 17 minutes. Got the start because Jusuf Nurkic (knee) was out and played 25 minutes. Leonard looks like he was created in a top secret military facility. Maybe he was created as a hedge for Ivan Drago, in case Rocky wasn’t successful. When that plan failed to materialize, he was sent back to the lab and given a jump shot from downtown. #13 player on the season and #6 over the past two weeks. Y’all know what time it is…. I dog McCollum plenty, but I have to give him his due when he balls out, as he’s been a top 20 player over the past six games. Question – How do you feel about 2 fantasy basketball managers trading the same player back and forth twice ? Not sure if this is an actual rule / setting, or if it’s an unwritten thing. I have not done this ever, but 2 teams in my league have & it’s causing some drama. Kawhi/Markkanen/Capela get traded for Harden/Gasol/WCS, few weeks ago. Which was a big deal at the time..
Ha! Good morning to you as well! Every owner is entitled to run his team the way he wants. Maybe the two are friends and one felt bad about the injury, so he wanted to help out the other. That’s fine. As long as the integrity of the league isn’t compromised, I have no problems with it. I’m not one to Veto, never have, never will. But that is a bit ludicrous. @Mr. Blast: Ha! Yeah, I hear you, but every owner values players differently and have separate agendas and motivations. Gotta let them run their teams how they want. @jeff: Give me Jokic or give me death. It does depend on your philosophy though. Are you playing for this year or the future? I have a slim chance to win this year. Do you think that is too much for Jokic? Would you trade curry and mark for jokic and some 2nd rd picsk? @jeff: So you’d be able to keep Curry and Jokic for next year? If so, at what cost? How many total keepers? So id lose Curry if i do the first trade unless i can trade him. Or should i trade curry and markannen for Jokic and 2nd rd picks or is that too much? @Son: My bad. You wouldn’t be able to do Curry for Jokic straight up? I dont think he would – and i need a pg if i get rid of fox and curry. 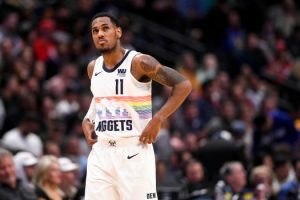 Would you trade curry and markannen for Jokic? 1. When Mirotic comes back I will need a drop. Who would you target at this time? 9 cat, 12 team league, in second place. Trying to move Mirotic due to bad playoff schedule but his health is putting fear in other owners. Thanks! I will give it a go. If unsuccessful on a trade, who is my drop to activate Mirotic? Hey man. What a trade just went down , crazy! So I have a dilemma. Nedd to stream somebody for friday and sunday. Options are: jaylen brown, smart, schroder or somebody from knickcs that wasnt traded(trier, knox, robinson). Now knicks will be short handed so maybe i should expect big game from knicks players? Who you recommend? @Max: So crazy. I love it!!!! !